Divide the chicken thighs in half and trim into equal square pieces. Set aside in a bowl. Blend the herbs, lime zest and olive oil to a rough paste. Set 60g of this herb paste aside for use in finishing the dish. Smash the garlic cloves with the base of a knife and mix into the remaining herb mixture. Add the marinade to the chicken. Cover and place in the fridge overnight. Do not discard the zested limes – cut them in half and reserve for later. Using the attachments from the Hub or Fusion BBQ, add the first fork onto the spit attachment and slide on one of the halved limes. Season the marinated chicken with salt and freshly ground black pepper and skewer on one piece at a time turning the pieces 45° each time to ensure an even shape along the rod. Once all the meat is added, slide the second lime on and use the forks to hold the meat together. In the meantime, preheat the BBQ. When the coals are ready for cooking, place the spit on setting 2 and begin the rotation. Monitor the heat topping up the coals when needed. It is important to maintain a surface temperature of around 100°C. Allow the chicken to reach a core temp of 65°C then lower the setting to 1 to colour the outside of the chicken. Remove the rod and rest on a cooling rack placed over a tray for 10 minutes before carving the chicken. Reserve the cooked lime halves for dressing. Leave to cook until the garlic is very soft and golden brown. Remove from the heat and squeeze the garlic flesh out of the skin into a bowl. Crush any remaining bits of the garlic with a fork and add to the bowl. Add the mayonnaise and stir well to mix. Season and set aside. Make the pickled cabbage by combining the vinegar and sugar in a small pan and heat until the sugar dissolves completely. Leave to cool, then add the cabbage, allowing to pickle for at least 2 hours. 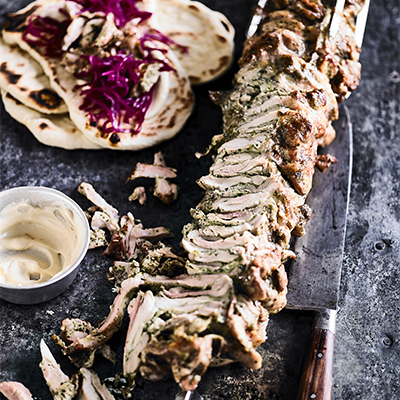 To assemble, spread the cooked, sliced chicken on a flatbread. Spoon over the reserved herb paste and top with some pickled cabbage. Dress with the garlic mayo and Sriracha chilli sauce. Season with salt and a squeeze of the roasted limes.